Why is it I feel compelled to clean the dishwasher inside and out, the stove inside and out and even the kitchen floor, right after I call a repairman to fix the non-functioning dishwasher? Maybe it is the remembered messages from the distant past (the 1980s) when mothers supposedly warned their daughters to wear clean underwear in case they were in an accident. After all, you wouldn’t want some doctor to think your mother hadn’t brought you up right. Or maybe it was the warning in Glamour Magazine that advised that before one went to the beauty parlor to get their hair done, they should wash and style said hair. The hair dresser would be compelled to make your hair look even better than it did when you walked in. If you walked in with dirty, stringy hair, you would have set the bar too low, and the improvement would be minimal. I supposed there is some weird logic in this advice, but if closely followed, it would require one to give up any sense of self – probably not a good plan. I do know some people who are of the opinion that if you hire a repairman, you are paying them to take care of the problem – the whole problem. That includes moving things out-of-the-way to provide a better work space, or in the case of the dishwasher, leaving the dirty dishes in place. There has to be a balance here, somewhere between my “smothering” approach and a complete disregard for any of the social niceties. I have tried to balance my behavior in this regard by keeping my natural tendency for messiness behind closed doors. 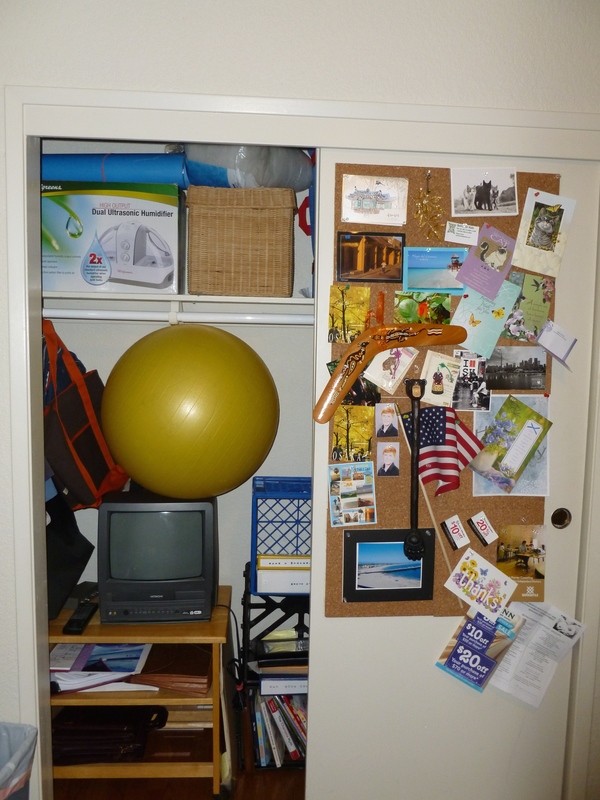 For example, here is a picture of the closet in my office with the door open. I probably should post a warning sign. HumaAq – the unique me!